Parents want to know far in advance if their children will be home tomorrow. MANHATTAN – With major storm expected to blanket the city on Tuesday — up to 20 inches of snow and wind gusts up to 40 mph — Mayor Bill de Blasio announced at noon Monday that schools will close. "This is a "very serious blizzard, one that everyone should take seriously," de Blasio said at an unrelated press conference Monday at noon. The closure will also apply to all after-school programs, officials said. ⚠ After-school programs, adult education, YABC programs, and PSAL activities are also cancelled tomorrow, Tuesday, March 14, 2017. The mayor said the Sanitation Department will have 2,400 workers per shift with 689 salt spreaders. Snow is expected to accumulate 2-4 inches per hour starting Tuesday at 6 a.m. Families had been urging the mayor on Twitter to make the call as soon as possible. In the most recent snowstorm last month, Mayor Bill de Blasio made the call to close schools the night before, sending out a tweet from the Department of Education at 6:43 p.m. on Feb. 8 that schools would be closed on Feb. 9. Approximately 10 inches of snow fell in some parts of the city that day. 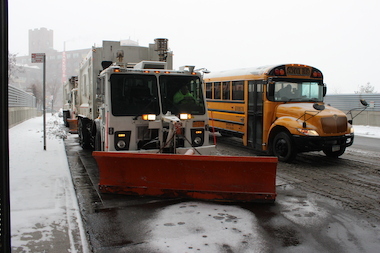 That decision to make an early call came after de Blasio took heat for his decision to keep schools open during a major snowstorm in February 2014 — much to the ire of many parents and teachers forced to navigate treacherous roads. Schools Chancellor Carmen Farina argued at the time that for many children, school was the only place they could get a hot lunch and that it should be up to parents to decide whether or not to send their kids to class.